Workout of the Week #25 and Indigenous People’s Day | Robert Mitchell Jr.
Can’t spell it? Doesn’t matter. Maybe that’s another way to disrespect it? I don’t know, but I kind of like it. Click photo to read the article at NPR. Monday is Indigenous People’s Day (a.k.a. Native American Day)! For some reason there’s a connection between Columbus Day and Italian heritage. That’s unfortunate because there are so many truly praiseworthy Italian figures — Giordano Bruno, Michelangelo, Raphael, Botticelli, Leonardo da Vinci, Titian, Pico della Mirandola, Petrarch, Dante Alighieri, and Giovanni Boccaccio come to mind — whom proud Italians could celebrate instead! 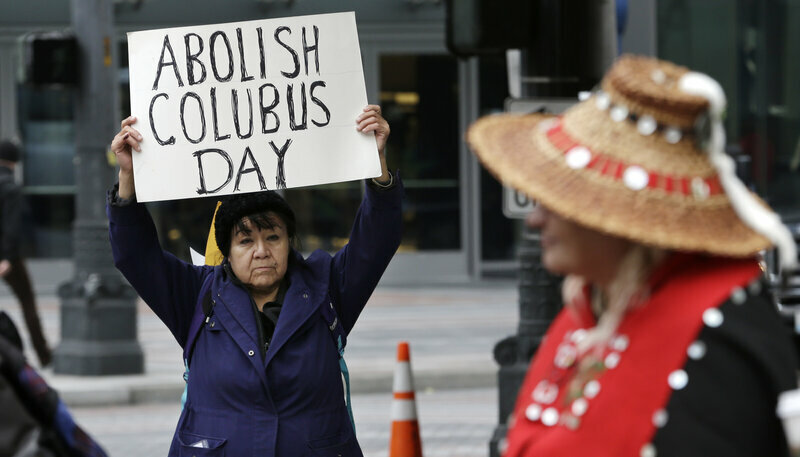 It used to be fringe idea that Columbus wasn’t really worthy of a holiday. But over the last ten or twenty years, a slow tide has been steadily rolling in. Colonialism’s gloss has rubbed away, humanity’s awareness has grown, and in some places we’ve seen the second Monday in October become Indigenous People’s Day. Yesterday Vermont joined the ever-growing cadre of states and localities ditching Columbus Day in favor of Indigenous Peoples’ Day. UPDATE 8/17/47: But is that really a good thing? It’s tough. I mean, to the 2 million members of the Knights of Columbus — I personally know two members who care deeply about their communities and do great charity work — Columbus is a hero. If we only allow holidays and monuments to perfect people there will be holidays or monuments at all. Escape Plan Drill: This one’s great to pull off on an outdoor track or a nice path through the woods. Set a round timer for 1:00 min. rounds with no breaks, or start a simple countdown timer to beep every 60 seconds (personally I’m a fan of the Timex Ironman watch). First round, shadowbox with as much speed and sincerity as you can muster. Second round, sprint around the track or down the trail as fast you possibly can — flat out. Third round, keep going with as much speed as you can muster, either walk, jog, run or (if you’re superhuman) keep on sprinting. Repeat that set four more times for a total of 15 minutes. Take as few 12-second breaks as possible to finish standing up. This entry was posted in Martial arts, Mysticism, Writing and tagged indigenous peoples' day, WOOTW. Bookmark the permalink. Pingback: Going Mobile with Workout of the Week #42 | Robert Mitchell Jr.